Star-crossed lovers, under the stars: Cincy Shakes puts on an outdoor performance of Romeo & Juliet this Friday at Linden Grove Cemetery in Covington. Starting at 7 p.m., Cincinnati Nature Center (4949 Tealtown Road, Milford) hosts Hoots & Hops, where you can sample local craft beers while exploring the park's trails. The purchase of a $35 ticket gets you in and includes beer and dessert samples, interactive nature stations along the trails and a live performance by New Brew. Ticket holders must be 21 or older and must show ID. The rock-n-roll band Red Wanting Blue plays Fountain Square's summer concert series starting at 7 p.m.
How's this for a unique Friday, the 13th event? 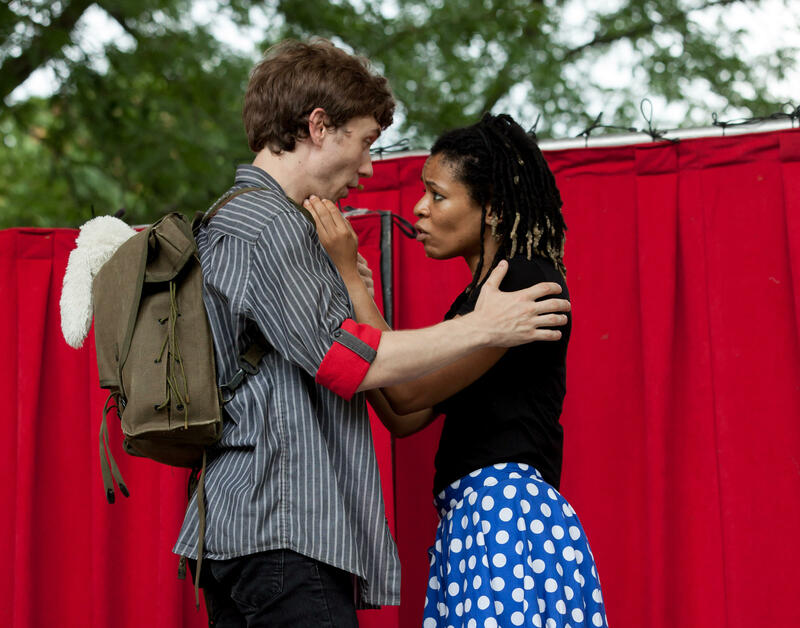 Linden Grove Cemetery in Covington (13th and Lee streets), hosts the Cincinnati Shakespeare Company for a free performance of Romeo & Juliet starting at 7 p.m. (Pictured, above.) Star-crossed lovers indeed. East Walnut Hills holds another "Walk on Woodburn," this time a "Jubilee In July," where from 6-10 p.m., you can stroll the street and visit shops like Urban Stead Cheese, the Woodburn Brewery, Wild Things Antiques and more. Its Facebook page promises "exciting changes taking place" so if you've been to WoW before, it may be time to go again. From 9:30 a.m. to 3 p.m., Winton Woods Harbor (across from 10245 Winton Road) holds its Kids Outdoor Adventure Expo, billed as one of the largest outdoor recreation and nature education events for kids in the country. There will be a variety of free, hands-on activities, inculding paddling on Winton lake, a climbing wall, live animals and fishing. Bradbury Tattoos, a live opera based on Ray Bradbury's book The Illustrated Man, visits Memorial Hall (1225 Elm Street) for two shows at 6 p.m. and 9 p.m. Tickets are $40; $20 for students. Fairfield's Blues & BBQ summer concert series at Huffman Park (2100 John Gray Road, Fairfield) continues with music by husband-and-wife duo Better Together and food by vendors like Hammann's Catering, Fabulous Funnel Cakes and more, all kicking off at 6 p.m. Put your observation and puzzle-solving skills to the test during "Escape from the Library" at the the Cold Springs branch of the Campbell County Public Library (3920 Alexandria Pike, Cold Springs). Registration is required for this free event that takes place from 4:45-8 p.m.
Connie Schultz, Pulitzer Prize-winning columnist and wife of Ohio Senator Sherrod Brown, gives the keynote address at the Antioch Writers' Workshop at the University of Dayton's Jesse Philips Humanities Center (300 College Park, Dayton) at 7 p.m. This event is open to the public, though registraton is required. It's the last night to view (and for free!) Marta Hewett Gallery's (1310 Pendelton Street, #104) "Summer Survey," a collection of works by artists like Dorothy Hafner, Kim Krause, Ed Bing Lee, Claudio Malacarne and more. Janet Jackson plays Riverbend (6295 Kellogg Ave.) at 8 p.m. and tickets are still available. It's the last day of Nostalgia Weekend at Carol Ann's Carousel (8 E. Mehring Way). The event takes place from 11 a.m. - 6:30 p.m. and promises to take you back in time to the 1920s-40s, when carousels were all the rage. There will be board games, themed crafts, and more. Starting at 6 p.m., photojournalist Malinda Hartong will share tips for getting great pictures with your smartphone or SLR camera during a photo walk at Miami Whitewater Forest's Tallgrass Prairie nature trail (9001 Mt. Hope Road, Harrison). This event is free. On another photographic note, Miami University debuts the exhibit, "Jim Brockman: Fifty Years Behind the Lens," featuring photography by the Fairfield resident, film photographer, and longtime teacher. Brockman will do a brief presentation of his work during a public reception from 2-4:30 p.m. The exhibit will be on display at the Voice of America Learning Center (7847 VOA Park Drive, West Chester Township) through September 12. Monday, July 16 kicks off Burger Week, where you can get $5 burgers at participating restaurants all over the city.